Hello and happy Friday! Here's a quick nail post to share the lavender gradient/ombre nails I did (last month... *sob*). I definitely feel like I could have done a better job; I did them basically in the middle of the night because I am a masochist the next day was the London Drugs Beauty Event (recap here) and I was all, how can a nail polish addict show up to this awesome beauty event without a fresh mani? Nope, gotta do them, even if I have work in the morning. Although a very opaque white, I'm not quite happy with the super-thick consistency of Sinful Colors Snow Me White (used here and here), which makes it hard to work with. I found a far superior white creme in OPI Alpine Snow, which is thinner, covers the nail easily and smoothly, and is still opaque. I sponged on China Glaze Lotus Begin (full swatch here) in two layers; if I had the time, I would have done a third layer just on the very tips for more dimension to the gradient. Here's a photo on the day of the Beauty Event, in natural light. I wish I could always take my nail photos in natural light--it's the most flattering for any skin tone. What are you up to this weekend? I might head down to English Bay to check out the first fireworks show of this year's Celebration of Light on Saturday. 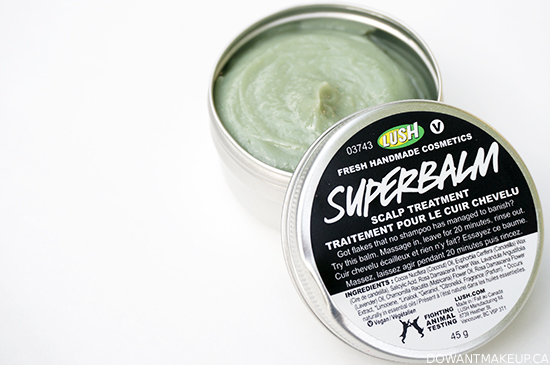 Superbalm is among one of a handful of new hair products LUSH debuted earlier this year. Although I was in a LUSH last month to have a one-on-one with a store manager about their facial moisturizer line, my eyes couldn't help but zoom in on the words "scalp treatment" and "flakes". Having dealt with a dry scalp for most of my life, I'm always interested in products that can help manage those embarrassing tiny white flakes. The formula's stars are coconut oil and candelilla wax to soothe and moisturize. It also uses salicylic acid, which is an exfoliant that helps shed flakes; it's an ingredient that is used in some anti-dandruff shampoos and appears to significantly reduce dandruff and seborrhoeic dermatitis problems (here's one trial abstract). Because of the high coconut oil content (it's the first ingredient! ), the texture depends largely on the current climate in your area. The photo on LUSH's product page shows a thicker, more balm-like texture, but in the current Vancouver summer weather, mine is considerably goopier--not that it's a bad thing, it kind of makes it easier to apply. Here's how I've been using it: following the instructions, I scoop some product up with my fingers and massage into my scalp, focusing on problem areas (mainly my hairline), and going back for more product until I'm satisfied that I've gotten to all my flaky areas. I clip my hair up--at this point it looks a little greasy because of the coconut oil--and do whatever for 20 minutes, then jump in the shower and wash my hair thoroughly. Sometimes I shampoo and rinse twice to make sure that all of the product is washed out. On one occasion, I was in a rush and didn't wash thoroughly enough; I still had some product in my hair so my hair looked greasy/wet in some parts. Because I pretty much never get an oily scalp or oily hair, the feeling and knowing it looked that way was absolutely maddening. Ugh, I'm never making that mistake again. I like the inclusion of lavender oil in the formula, which has a calming, relaxing scent that is perfect for a pre-bedtime shower. LUSH also cites lavender oil as an antiseptic and antibacterial ingredient, which may be helpful to those with dandruff or seborrhoeic dermatitis, since both can be caused by a type of yeast. Although we all know the general rule to skin care is patch test first, I especially recommend a patch test for this product because (1) a scalp that is dry/afflicted with dandruff can be extra sensitive and (2) salicylic acid can cause irritation in rare cases (source). I have had no problems with using it on my scalp and have left it on for way longer than 20 minutes before with no adverse effects. Aside from the slight annoyance of washing my hair out very, very thoroughly, Superbalm has worked really well at reducing my flakes; I would repurchase and I would recommend it to other people dealing with dry scalp or dandruff. Final note: the ingredients list on the LUSH product page is definitely incorrect--there is no way salicylic acid is the first (highest concentration) ingredient because it would probably take your scalp off. The ingredient list I have below is taken from the actual product labeling and is most likely the correct one due to regulations on product labels. Do you have dry scalp or dandruff? How do you manage it? Essie Urban Jungle is one of two neutrals in this summer's Haute in the Heat collection and if you ask me, it's incredibly versatile and so, so pretty. 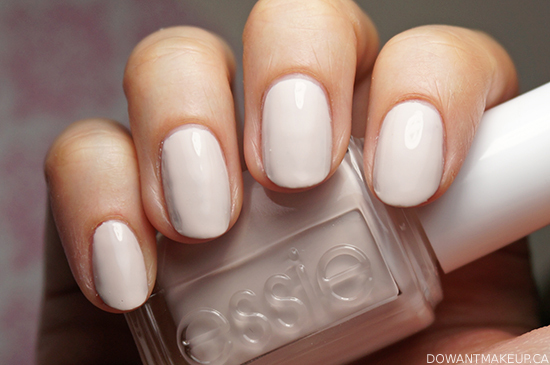 Essie calls this shade as an "irresistible alabaster orchid", which is a perfectly chic description for a perfectly chic polish. Although it looks like your run-of-the-mill off-white creme, Urban Jungle has hints of grey, pink, and yes, pale, pale lavender/orchid depending on the lighting. Surprisingly, I don't have a dupe for this in my collection. This shade is awesome for everything. I feel like it would be right at home on the tips of everybody from a romantic bride to a fashionista to a poolside sun bather. Between this and Chinchilly, I have to say that Essie is amazing at coming out with beautiful and versatile shades that don't quite look like anything else. But it's not a perfect 10 for me. I've generally felt that the Essie formula is tricky to work with, and Urban Jungle is no exception. It's streaky and although it evens out significantly by the third coat, you can see at some angles that the end result can be slightly lumpy (a generous coat of Seche Vite or other thick top coat helps a lot, too.) It is a bit unforgiving, so it is best to apply in as few brush strokes as possible (don't go back to "smooth out" a stroke!) and very gingerly with light pressure on the brush. Even with some application issues, I love this curiously unique shade and will wear it year round! Do you have a favourite neutral polish?